Rediff.com » Getahead » Watch! Is this the most important race in India right now? 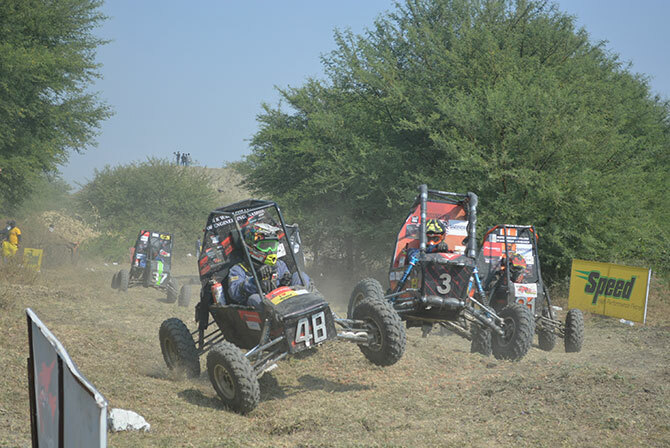 The Mahindra BAJA SAE India recently held its annual challenge for undergraduate engineers. IMAGE: Tackling the speed bump with ease. What is the BAJA SAE series all about? The BAJA Society of Automotive Engineers is an annual global challenge for undergraduate students. In India, it is run by SAE India. Each participating college has a maximum of 25 students or a minimum of five on its team. Each team has to design and build an off-road car or a buggy that can survive rugged and treacherous tracks. IMAGE: And that's the track for the first leg of the 12th edition of the Mahindra BAJA SAE challenge. The test was divided in two categories -- eBAJA for electric buggies and mBAJA for petrol buggies. The challenge had three stages. This stage looked at the design, cost and sales presentation. 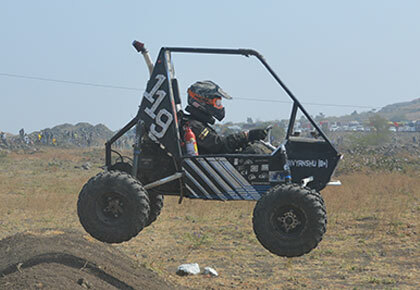 The buggies were tested on their manoeuvrability, traction and suspension. This year, a new obstacle was added -- the rock crawl. 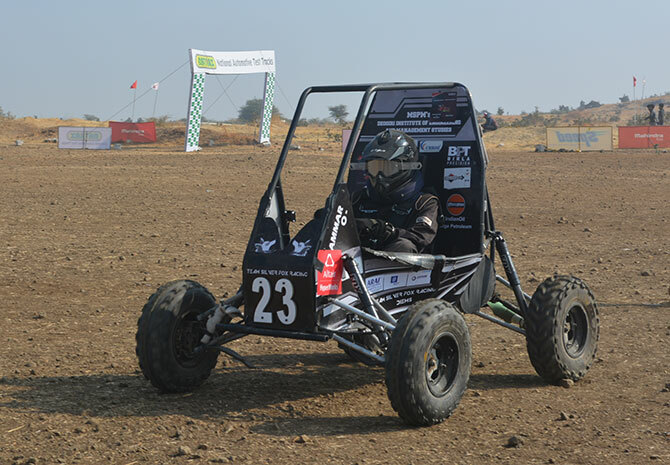 Finally, the electric and petrol buggies had to drive through a 4.8 km endurance track within two and four hours respectively. IMAGE: The all girl team at BAJA 2019. IMAGE: mBAJA... it's non-stop action all the way. We were invited to witness the mBAJA endurance test, where 85 out of 120 teams that qualified displayed their engineering skills. As the event started, the air reverberated to the sound of the buggies racing by. IMAGE: Ssh! Students at work. IMAGE: Nothing would distract these students. The frantic energy at the pit stop was electrifying. The fact that it was a makeshift pit stop in conditions that were harsh did not seem to matter to the competing teams pushing their buggies in for temporary fixes or refuelling. They were not trained professionals but that did not dent their enthusiasm. 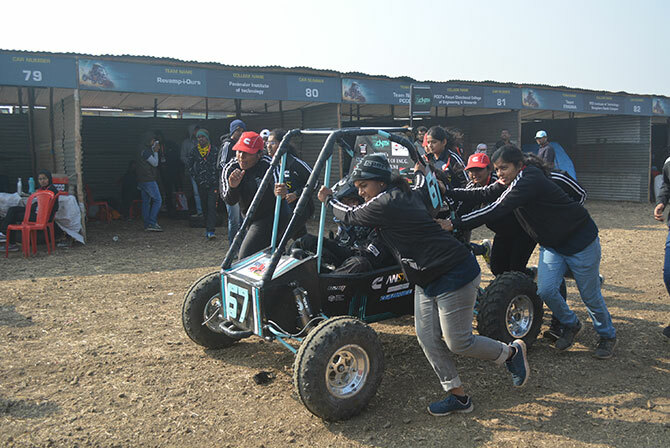 IMAGE: Students pushing their buggy to the pit stop. 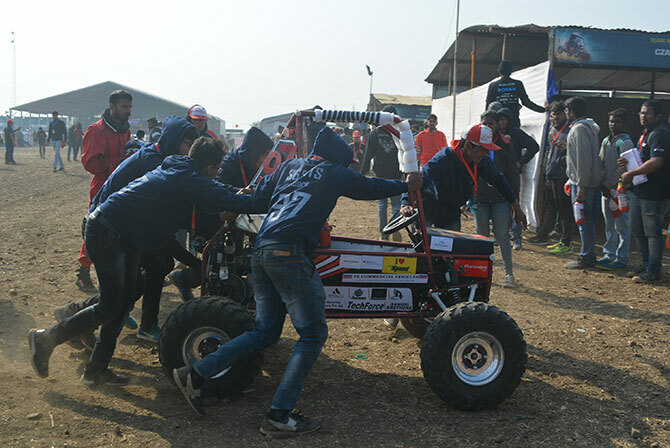 The buggies had to be driven through a treacherous 4.8 km long track, dotted with multiple speed bumps, dunes, rocks and mud pits, within four hours. They could stop for refuelling or because of a breakdown or to change the driver, but it would cost them time. The key to successfully passing through these hurdles was to keep the buggy as light as possible so that the impact would be softer when the buggy jumped. 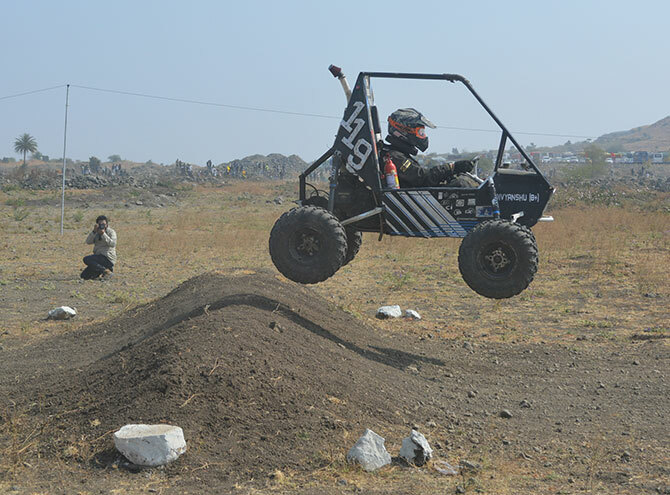 Most of the buggies participating this year were able to keep the weight down to 120-125 kg. Another way to shave the weight was to use a light driver; we heard some of the drivers ate less or followed a special diet plan to lose weight for the race. Each buggy had to have a seat belt, a fire extinguisher and a kill switch (to shut the engine at once). Each driver had to wear a helmet and pass a test to prove they could get out of the vehicle in five seconds; if they couldn't, they were disqualified. We were told there had been no accidents since the challenge began in India 12 years ago. IMAGE: One of the participating buggies. 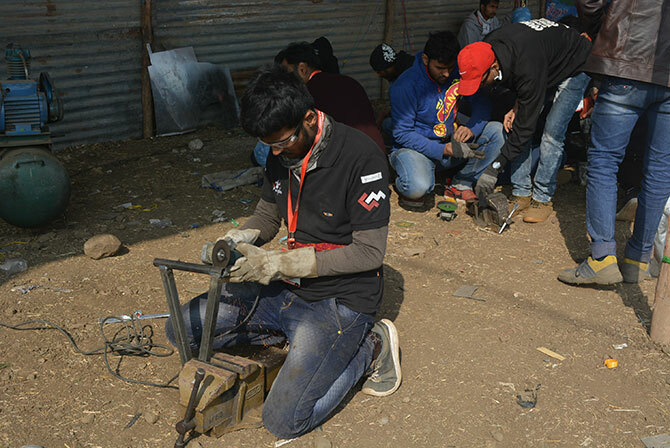 Each team had to build the buggy in their college campus, according to the instructions given by Mahindra. They could only use the Briggs & Stratton engine, with 305 CC displacement. The engine was to be bought from outside and no alteration was to be made to it. We caught up with the winner of mBAJA. Watch the video below. Based on their performance at the event, Mahindra recruits third year students as interns even before they graduate. Later, they could become full-time employees. Mahindra plans to bring autonomous mobility engineering to the BAJA platform through an event where student can showcase driverless cars they have built themselves. Think you can make your own car? Who says girls can't make cars?